Shina Singla of Sanmati Vimal Jain Senior Secondary Public School here has topped this year’s senior secondary examination conducted by the Punjab School Education Board in the humanities faculty. Having devoured all available roadside space in the city long ago , the encroachment mafia is now gobbling up the vast roadside space between Chand Cinema and New Sabzi Mandi along the GT Road. Space on the footpath as well as along the road is being ‘allotted’ to roadside barbers, cycle mechanics and so on. “He is: therefore I am. I feel a flow of warmth for my father, who patiently watched me grow along with my mistakes for being infinitely wise. He knew that one learns from ones mistakes and not by reprimands. Father I salute you; I am glad that the day is marked in your honour”, said 24-year-old Rajeev Singla , an exporter and gift shop owner. His sentiments were not echoed by many children. In fact, Father’s Day has not raised much publicity. Even gift shops have mixed cards on Father’s Day with others. 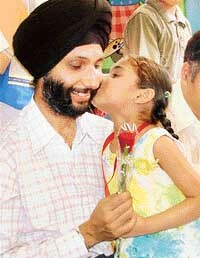 Rajeev says, “Father’s Day is not that popular. We think it is not commercially viable so the companies do not print a great variety of cards on Father’s Day. A woman of Bassian village has reportedly sustained burn injuries and is admitted to a Raikot hospital with over 80 per cent burns. According to sources, Hardeep Kaur (20) was married to Nirmal Singh of the village two years ago. Youth Congress (YC) workers, led by district president of the party Komal Khanna were today carrying brooms and dust bins in place of the customary flags and banners. The YC workers were on a cleanliness drive in Ward No 66 of the city. 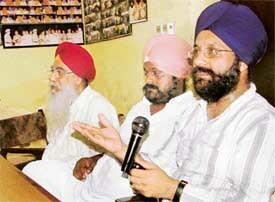 The Punjab State Fruit and Vegetable Commission Agents Association has claimed that the Punjab State Agricultural Marketing Board (Mandi Board) had conceded its major demands. Oriya people here took out a rath yatra for the first time. The excitement and religious sentiments at the yatra were as exciting as backhome. A beautifully decorated chariot of Lord Jagannath was pulled by the devotees. A bhommi poojan was also performed. Greeb Das, alias Greebu, and his father Dhuna Ram, residents of Kothe Sher Jang, have been booked under Section 297 of the IPC for distributing vulgar and obscene pamphlets. With many new courses available, students do not have to go in for simple graduation in Arts, science, and commerce. These days, education is a big business and big corporate houses have started courses which till now were unheard off. A group of newspapers has also started higher learning courses in South India. Manmeet Kaur, an MCA student of Punjab College of Technical Education (PCTE), has bagged the first position in the first semester exams of Punjab Technical University held in December, 2003, by scoring 617 out of 800 marks. 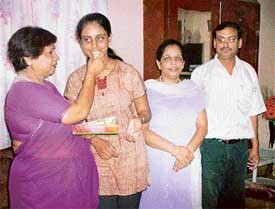 Ela Sharda of PCTE got the sixth position in the examination with 86 per cent marks. Sandeep Bhardwaj of IIM, Phagwara, bagged the second position in the university by achieving 87.8 per cent marks. A 20-day summer camp for children concluded at Chanda Mama Nursery Play School here today. Personality development, besides art, craft and dance activities, was the main focus of the camp. Children also made finger puppets, face masks, balloons, kites, glass painting and decorated candles. Postgraduate students of Guru Nanak National College, here, have done well in their examinations this year. The results of MA Part I and Part II (Punjabi) is 100 per cent for the second consecutive year. A meeting to review and step up the efforts towards TB eradication was organised at Dayanand Medical College and Hospital (DMCH) here yesterday. Dr Jagdip Whig, Vice-Principal and in charge of the Chest unit at DMCH, presided over the meeting which was attended by medical officers of peripheral DOTS centers working under the hospital. The Pensioners Information Centre Management Committee organised a free medical check-up camp at the Pensioners Bhavan here today. Mr B.R. Kaushal, chairman of the committee, said the State Bank of India, Civil Lines, organised the medical camp to mark the second foundation day anniversary of the Bhavan. Geetansh Khaira gave another fine batting performance, remaining unconquered at 73 as Tony Mahajan XI trounced Patwari XI by nine wickets to register second consecutive win in the 8th Chaman Lal Malhotra Cricket Cup Tournament (u-14) being organised by the Ludhiana District Cricket Association at the Arya College for Boys here today. Geetansh had scored match winning 96 runs against Charanjit Singh Ahluwalia XI in the inaugural match of the tournament.